The National Thoroughbred Racing Association (NTRA), Daily Racing Form and the National Turf Writers and Broadcasters (NTWAB) today announced that HRTV has won the Media Eclipse Award for Television – Features for its documentary “HRTV Presents: Saratoga WarHorse,” an in-depth look at the work of a foundation taking a leading role in assisting struggling war veterans and their extraordinary relationship therapy with recently retired Thoroughbreds. The 30-minute program, produced by Stacie Clark-Rogers, aired on November 2, 2013. The honor will be will be presented to HRTV at the 43rd Annual Eclipse Awards dinner and ceremony which will be held on Saturday, January 18 at Gulfstream Park Racetrack and Casino in Hallandale Beach, Fla. 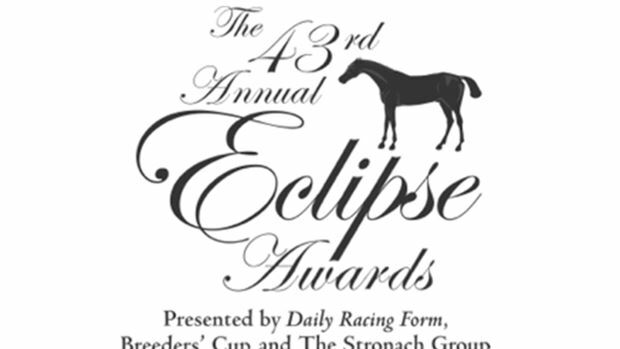 The Eclipse Awards are presented by Daily Racing Form, Breeders’ Cup and The Stronach Group and produced by the NTRA. The Saratoga WarHorse Foundation and facility in upstate New York has taken a leading role in assisting struggling war veterans through debilitating effects of Post-Traumatic Stress Disorder (PTSD), as well lingering serious issues related to suicidal thoughts and sleeplessness. HRTV examined this three-day program through revealing interviews and the stories behind the emotional attachment between veterans and horses. Among the most poignant moments in the piece was a Thoroughbred, after walking numerous times around a circular metal pen, gaining trust in the veteran and voluntarily walking up to him and creating an equine-human connection. In addition to the war veterans, among those interviewed in the presentation were Bob Nevins, Founder, of Saratoga WarHorse and Marilyn Lane, Director of Thoroughbred Industry Relations and Development and horsemen Nick Zito, Bill Mott and, Cot and Anne Campbell. Amy Zimmerman was Executive Producer and Writer of “Saratoga WarHorse.” Steve Scheilder was co-producer and editor. Jose “Joe Chile” Ibarra was the principal videographer. This is the fifth Media Eclipse Award won by HRTV for productions appearing on the network, and the third time for programs which were written and produced by HRTV. In 2011, HRTV won the Television-Features award for a documentary on jockey Randy Romero. In 2010, the network was honored with the Eclipse Award for “Inside Information: Swale” about the 1984 Kentucky Derby and Belmont Stakes winner. Judges for the Television – Features category were: Jim Bannon, Television Commentator at Woodbine Entertainment Group; Dave Johnson, television producer, host and longtime racing voice of the Triple Crown and G.D. Hieronymus, Director of Broadcast Services at Keeneland Association. Honorable mention in the National Television – Live Programming category also went to HRTV for “Inside Information: Dancer’s Image,” a documentary examining the events and controversy surrounding the1968 Kentucky Derby, which aired on July 14, 2013.